By the time I was born my parents had closed the book on their life of tramping and mountaineering, and most of our holidays became art affairs. I do wonder sometimes if they might have overestimated a tad the level of my enjoyment of the chosen destinations and activities, at least when I was a toddler: my mother for instance always spoke of the fact that when I was two years of age I tumbled into the François tomb, that great masterpiece of Etruscan funerary art, as a sign of a precocious passion for all things ancient, as opposed to poor gross motor skills, as was no doubt the case. Be that as it may, save for a stretch of four or five years when we joined a group of dear friends for camping holidays on the seaside at Santa Maria di Leuca - the very tip of the heel of the boot that is Italy - we caravanned around Italy first, then Yugoslavia and Spain and France and Greece and England, and hardly a church, scarcely a museum was left un-visited. Spain and Greece, in particular, we both "did" in three weeks or so each. That is a lot of art and archaeology to cram into so short a time. To say nothing of the fact that we must be the only people ever to have toured Greece without dipping so much as a toe in the Aegean sea. Cramming does funny things to memory: I have perhaps five or six snapshots of Spain in my head; Greece is the Acropolis, the Charioteer of Delphi, a sunset in Thessaloniki, a grilled swordfish that nobody thought I was going to be able to finish - but I did. All those memories are quite vivid but beg the question of why we even chose to do more than four or five things per trip. Okay, maybe not literally, but what was there to gain in attempting to see everything? In my father's case, I wonder now whether he felt that every trip to a destination was going to be his last time there. His father had died in his fifties, so it wasn't an unreasonable expectation, and it's only natural that as a child I should look at a very different time horizon. To this day my attitude hasn't changed much, in fact: I seldom treat a trip as anything other than a chance to see a place that I am going to have the option of re-visiting an indefinite number of times. Foolish, I know. And it's not as if I have any regrets, those holidays are the stuff that the history of my family is largely made of. But from a detached, philosophical standpoint, visiting countries in this way strikes me nowadays as almost predatory. We never had meaningful interactions with the locals, beyond innumerable transactions with members of the hospitality industry. We let our Touring Club guidebooks tell us what was worth seeing and what wasn't (each attraction had one star, two stars or none, based on criteria that were never explicitly questioned in my presence). We motored through museums, 'taking' the artworks we had come to see and ignoring the rest. 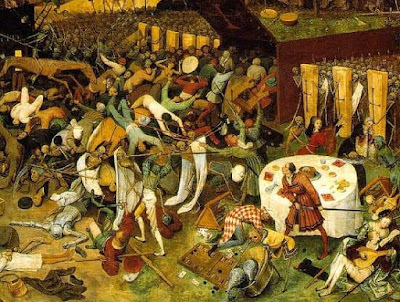 And culture could be curiously misplaced, of course, so for instance to this day for me some of the best Flemish art comes from Spain, because it's at the Prado that I saw Bruegel's Triumph of Death. All of these artworks, these fragments of past cultures that oftentimes had been produced elsewhere in the first place, came with very little context other than what was offered by the trusty guidebooks, and by my parents' not insignificant and mostly self-taught knowledge of such things. But the museums themselves I cannot remember at all, other than for their contents, which they displayed on blank walls alongside small plaques bearing name of the artist, title of the piece, year of creation (if known). Perhaps a museum is meant to be just that, a plain, non-memorable backdrop, secure and carefully climate-controlled, where to admire masterpieces. Attempts have been made to call attention to the building itself - notably by the Louvre in recent years - but ultimately it's the Mona Lisa that people come to see. Maybe so. But since moving to New Zealand, and being introduced by institutions such as Te Papa to the notion of the cultural museum, I've often thought that my own country and others comparably blessed in terms of artistic heritage could benefit greatly from this kind of approach. I love the Uffizi, it's one of my favourite places on earth: but if it could provide me with some history, with an idea of the times that produced the works of Giotto and Duccio, of Michelangelo and Raphael, wouldn't that be something of value? I'm thinking of kids who might not be as lucky as I was, to have passionate and knowledgeable parents (to a fault, one might say). But without context, and an understanding of the sets of connections and relations that inscribe artefacts into the culture that produced them, the past is truly - as in my all time least-favourite quotation - 'a foreign country'. Te Papa, the National Museum of New Zealand in Wellington, won't stand for that sort of thing. Nor will the many early settlers, ethnographic and historical museums that dot the country, and that range in my admittedly limited experience from the early colonial village Justine and I visited eight or nine years ago in Greytown - where a ginger cat gave us a guided tour of the otherwise deserted little square where a church, a fire station, a primary school and a shed full of old farming implements stood - to the highly impressive Waipu Museum, self-styled 'best small museum in New Zealand' and northernmost destination of our recent summer holiday. What follows might be in some way influenced by the outrageously kind and gracious hospitality of Lyn and Tony, who took into their home the equivalent of a little motorised plague of locusts - that's how I'd describe a family travelling by car and comprising three kids aged zero to seven - without ever letting their bonhomie be even remotely affected by all the screaming and the tantrums (and that was just us adults), but I vigorously recommend a visit to this museum if you happen to find yourself in Northland - and there's no earthly reason why you shouldn't. For one thing, the place used to be called "Memory Hall" - so how could I not like it, right? For another, it tells in a manner that is both meticulous and engaging how the town came to be. For such a small place - Waipu has a population of 1,491 according the most recent census - it is truly an outstanding resource, a museum/library where all but the most recent of residents can trace back family histories and contribute their own artefacts and stories. The production values are easily worthy of a national museum and the endeavour must have represented a significant investment on the part of the local community; it bears noting therefore that it's at least partly a by-product of local affluence, and not something that every small town can aspire to regardless of circumstances. It also helps that the history of the settlement is truly remarkable, the result of the long peregrinations of a staunch group of some 800 Scottish migrants, led by the charismatic figure of their pastor, Rev. Norman McLeod, who together travelled first to Nova Scotia, then to Australia and finally reached New Zealand in the 1850s. 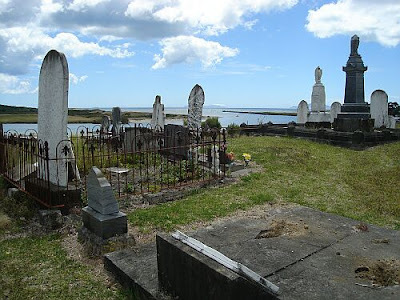 South of the township, and also highly worthy of a visit, is the cemetery where the people whose deeds are celebrated at the museum are buried. It is difficult not to be struck there by a rather powerful sense of place, or rather of places, because the distances covered in the most dangerous and desperate of circumstances by the people who came to rest here make themselves keenly felt as well. The telling of history is a difficult business, and just as one does at Te Papa, so too at the Waipu Museum it is hard not to wonder about other histories that might have been left out. How did the relationship with the local tangata whenua, the people of Patuharakeke, develop after those early and apparently amicable encounters? What was it like not to share the worldview of Rev. McLeod? What were the mechanisms of assimilation and exclusion of this staunch and devoted community? Fantasising about what a museum of this kind would look like in my native Milan I can only begin to imagine how much more contentious and numerous such questions would be - the politics that such a museum would have to navigate, intersecting with secessionist aspirations of the local politicians, our recent fascist history, the mythologies of industry and self-made worth that remain an enduring source of pride in spite of the harsh reality of our decline, truly make my head spin. But I'd really like somebody to try. We should be more like Waipu. Older ways of thinking about museums, as sets of static, decontextualised objects, are unhelpful [...] and inaccurate. Museum objects are in a very definite set of contexts, even if they have been through a series of networks and relations to get where they are at present. The Relational Museum project, which ran from 2002 to 2006, was based around the idea that museum objects to some degree conceal the mass of relations that lie behind them, ranging from the people who originally made and used the objects, to all parties to their trade and transfer and ending, for now at least, with the curators, conservators and visitors who make up the museum community in the present. And lastly, I realise that the post's title could expose me to charges of false advertising. 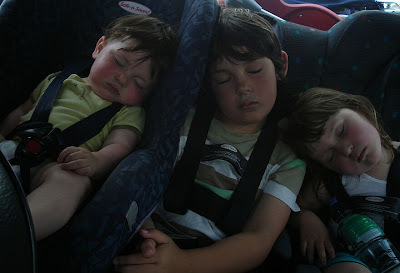 So here's a snapshot from the holiday, nicely capturing - if I say so myself - the adorable little locusts in a rare moment of peace as well as a sense of how hot it was up north. Very interesting topic. As someone that left an old country (Italy) to go to a new one (Canada) myself, I found a stark difference in historic museums as well. I remember the Greek museum in Taranto, so overwhelmed by things to see in a bland building, as somewhat of an underwhelming experience. I was a kid (I'm lucky as well that my parents brought me along in many cultural oriented trips), but I'm sure the pieces were magnificent, just the atmosphere not that engaging. To add to your point, I have the feeling that in a new country like Canada, anxious to establish a history, especially at a local level, museums can be used more as a legitimating tool than just a container of beautiful, ancient things. As an example, I lived the first year in Canada, in a small suburb of Ottawa, called Nepean. Only a few blocks away, there was the so called Nepean Museum (http://nepeanmuseum.ca/), a room with every possible artifact related to the Nepean community. Some were right out ugly, and to someone like myself, whose family owns a house built in the 1800, to see in a case the model of an objectively unattractive sport complex built in 1973 as something to preserve and celebrate seemed a bit naive. On second thought though, who am I to judge the passion of the people who put a lot of unpaid time (the museum is run by volunteers) to build a shrine to their community, creating the bases to build its recorded history for the future generations? I came out of the experience, if not more culturally savvy, definitively refreshed by this new, at least for me, approach to the museum institution. You remember all those rooms full of Greek vases at the Taranto museum? One of the caretakers took us through the storehouse when I was a kid, and we were treated to crates and crates (and crates and crates and crates) of more Greek vases. I'm sure it's a problem that other countries would like to have, but it's a problem nonetheless: our museums are already under-resourced (the Uffizi as of a couple of years ago where nearing financial collapse) and have to deal with and account for a lot more stuff than what you get to see. No wonder they are so consumed by conservation above all else. As for what is ugly versus what is significant, or what is a new country versus an old one (unless you meant "old country" in the sense of the one you came from), or whether something from 1800 is inherently worthier of preservation than something from 1973, there'd be a lot to say, and hopefully we'll get to have that conversation - I think it has to do with the concept of lived memory, and the continuities and discontinuities in our histories. I'll limit myself here to the observation that in the various stages of my schooling I studied the phoenicians three times, and the second world war just once, and stutteringly. Do you think it is a coincidence that we are taught so much about the ancient Romans and so little about the Fascists?